Minimalist pack comes with 70-ounce/2 liter bladder, deep pocket for snacks and wallet, exterior bungee with barrel lock. Low-profile athletic cut rides above jersey pockets, below bike helmets. Adjustable waist/shoulder fits men and women. Wide mesh straps and chest shock absorber reduce bounce. Cushioned, ventilated back panel. FDA-compliant food grade bladder constructed with triple-heat sealed edges, 2” opening for easy fill and cleaning, heavy duty kink-free sip tube, cushioned bite valve, twist-lock to prevent leaks. Carry fluids without extra bulk. 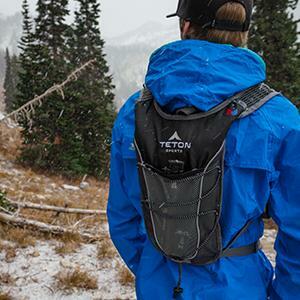 This ventilated hydration pack has an adjustable fit to eliminate chafing. Room for essentials and an included 70-ounce bladder that won’t leak. Minimalist pack comes with 70-ounce/2 liter bladder, deep pocket for snacks and wallet, exterior bungee with barrel lock. Low-profile athletic cut rides above jersey pockets, and below bike helmets. Adjustable waist/shoulder fits men and women. Wide mesh straps and chest shock absorber reduce bounce. Cushioned, ventilated back panel. FDA-compliant food grade bladder constructed with triple-heat sealed edges, 2-inch opening for easy fill and cleaning, heavy duty kink-free sip tube, cushioned bite valve, twist-lock to prevent leaks. The TrailRunner2.0 pack comes with a lifetime warranty.